Steve Davies scored in injury time to force an FA Cup replay against Tottenham on Sunday. Goalscorer Steve Davies celebrates with team-mates and fans. The visitors started with an entirely different XI to the one that fought back from two goals down to draw at Juventus, but 10 senior internationals were fielded, with Mauricio Pochettino perhaps wary of a replay after Newport County took his team to a second contest in the previous round. 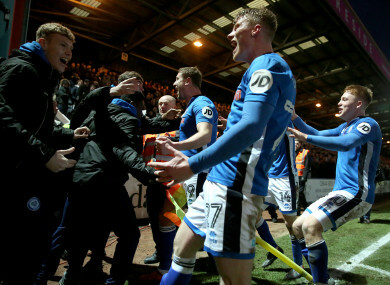 Regardless, an evident lack of understanding between Spurs’ players plagued them and Rochdale made the most of the £500,000 relaid pitch to score a brilliantly worked opener through Ian Henderson – the Dale captain scoring his sixth FA Cup goal of the season, no player has more. Dale’s composure and tenacity looked to have been outdone by greater top-flight nous in the second half as Lucas Moura capped his full Spurs debut with a well-taken goal, before Dele Alli was fouled in the box and Kane stepped up to smash home and quieten the ground where he made his senior bow seven years ago. But Spotland was rocking three minutes into stoppage time when Davies calmly found the corner to send Keith Hill’s men to a Wembley replay, with a quarter-final tie against Swansea City or Sheffield Wednesday up for grabs. Once again Rochdale picked a Spurs pocket, Harry Winks robbed this time, before Stephen Humphrys picked out Andy Cannon, whose decisive touch to Henderson allowed the captain to smash home, with Pochettino’s defence caught out of position. Email “Rochdale force FA Cup replay at Wembley with dramatic stoppage-time equaliser ”. Feedback on “Rochdale force FA Cup replay at Wembley with dramatic stoppage-time equaliser ”.